HAPPY HOLIDAY BLESSINGS to all of our MCLA family & friends. Please help us celebrate our amazing firefighters who have done such an incredible job for all of us. Click here for the Woolsey & Paradise Firefighters Healing Fund. We are ALL so grateful and have so many blessings to appreciate and be thankful for during this special season. Please help us honor and support the Firefighters Healing Fund. PARADISE, California (AP) — A powerful wildfire in Northern California incinerated most of a town of about 30,000 people with flames that moved so fast there was nothing firefighters could do, authorities said Friday. Nine people died, including five who were found in their burned-out vehicles. Only a day after it began, the blaze near Paradise, CA., had grown to nearly 110 square miles and was burning completely out of control. MCLA’s beloved and sacred Gindling Hilltop Camp was totally and completely burned to the ground as the Woolsey fire roared through the hills over Malibu and the Pacific Ocean destroying everything in sight. For those of us fortunate enough to settle down and relax with family and friends and loved ones and watch football and eat sumptuously and joyously celebrate Thanksgiving in the warmth, safety and comfort of our homes, we must remember that virtually hundreds of people are still missing right now in the wake of ferocious, deadly, apocalyptic wildfires that have been rampaging uncontrollably across both ends of California. The monstrous blazes that ignited earlier this month have claimed a total of 82 lives while laying waste to an area of nearly 400 square miles, according to the California Department of Forestry and Fire Protection. Officials said that only 64 of the remains have been positively identified so far. The vast majority of the deaths -- 79 total -- were due to the Camp Fire in Northern California's Butte County, making it the deadliest and most destructive wildland fire in the California history. The number of people missing or unaccounted for in Butte County was up to 1,202 on Sunday but decreased to 699 on Monday night as the list of accounted individuals increased, according to Butte County Sheriff Kory Honea. 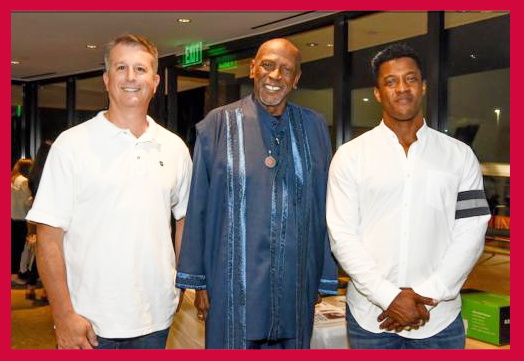 “Our firefighters do their jobs so well and we take them for granted,” said Malibu resident and famed actor Lou Gossett Jr., honored guest speaker at a special September 11 event benefiting Firefighters Down. The event featured a touching and beautifully shot film depicting the horrors that firefighters encounter each day, as well as the unique challenges firefighters encountered on Sept. 11, 2001. In the film, Captain Henry converses with everyday citizens eliciting their thoughts on the emotional challenges that firefighters encounter and the ripple effects their sometimes haunting, stressful experiences have on those they love as well as their colleagues. Firefighters Down Director of Therapy, Dr. Stephen Johnson, is chief designer and manager of the FFD therapeutic program. Customizing each session to meet the specific needs of the injured Firefighters served. Stephen J. Johnson, Ph.D., holds three advanced degrees and was awarded a Fellowship in Rehabilitation Psychology from the University of Southern California. He has been a licensed psychotherapist, consultant, and educator for over 40 years. He is the founder and director of the Men’s Center of Los Angeles, formed in 1988, and has conducted workshops and retreats for men and women for over 30 years. The program not only supports the healing of Firefighters after injuries but also the Post-Traumatic Stress Disorder (PTSD) that haunts firefighters and their families for months and even years following the occurrence of the trauma. FIREFIGHTERS DOWN HEALING TEAM: Mojghan Henry, Captain Rick Brandelli, Douglas Sutton, Captain Mike Henry, Karen Fuentes. Dr. Stephen Johnson and Men's Center Los Angeles are proud to support and endorse our very own Captain Mike Henry and Captain Rick Brandelli and this powerful wounded warrior program designed to assist Firefighters. The program offers a four-day intensive therapeutic and rehabilitation program for firefighters. 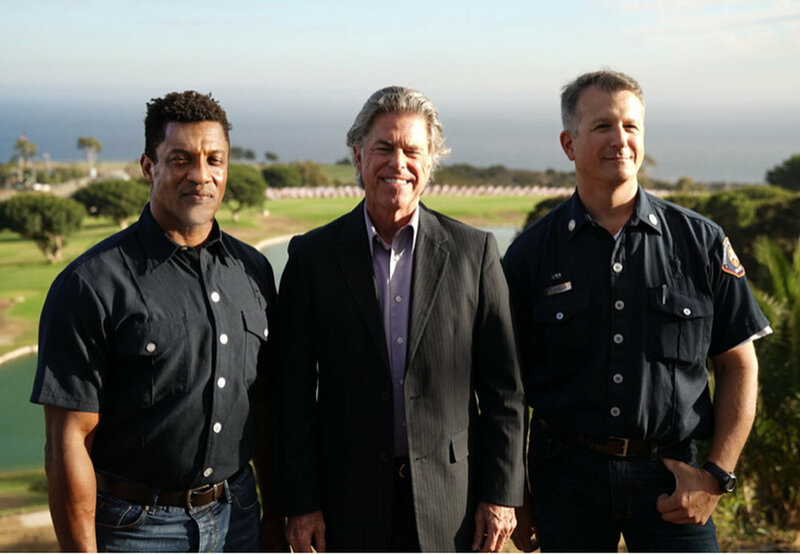 A film previewed at the 9/11 event at Pepperdine revealed that most Americans are unaware that more than 30,000 firefighters are injured each year on the job and rates of PTSD, suicide, divorce, depression and addiction – consequences of firefighters dealing with the stressors inherent in their job – take serious tolls on firefighters, those who love and work with them, and in turn, on the greater community. Captain Henry emphasized that one of the most healing things for those affected by these challenging conditions and emotions is so very simple: showing appreciation to the firefighters for what they have done for all of us. “We want to take the firefighters down to the Pier, to dinner, to help them relax and know that we are all thankful for all that they have done,” he said. LOCATION: Beverly Hills Benedict Canyon on 17 acres, Firefighters Down in partnership with InsightLA and Men’s Center Los Angeles. The stresses arising from on the job injuries. The accumulation of Traumatic rescues on themselves and loved ones. A healing at the soul level, daily practices that enrich themselves and their families are our gifts. Mental trauma is NOT a sign of weakness. It’s a sign of compassion for your fellow man. * It’s time we looked out for each other and made it OK to talk about the pain. * Trauma affects the mind in the same way as it does the body. * First Responders see more tragedy in a day than most will see in a lifetime. * The effects are cumulative with the burden becoming heavier by the day. * Each person will cope in a different way but everyone has their breaking point. * The ability to cope depends on overall health and sleep debt. * Sleep deprivation mirrors traumatic brain injury, resulting in the same symptoms. * Many turn to drugs and alcohol to numb the pain. * The effects bleed out into our family life as well. * The First step is admitting that you are affected by the things you see. * PTSD is more than an acronym. It’s claiming the lives of our brothers and sisters. * The next step is to talk. Talk as a crew, talk as a family. Find your Tribe and reach out. * The final step is to take control of every element of your life. * Find something bigger than yourself and pour every ounce of who you are into it . . . Firefighters Down “Mindfulness in Nature” relationship retreat group in June. THANKSGIVING 2018 __ As we all reflect upon our many blessings on this very special day, let us be especially grateful and honor the wonderful work done by all of our country’s First Responders and Firefighters. Our entire Men’s Center Los Angeles community is so grateful for your service and extend our deepest appreciation for all you do. HAPPY THANKSGIVING to all of our MCLA family & friends. Please help us celebrate these amazing heroes. Click here for the Woolsey & Paradise Firefighters Healing Fund. We are ALL so grateful and have so many blessings to appreciate and be thankful for on this very special day. Please help us honor and support the Firefighters Healing Fund. MCLA is proud to support and endorse our very own Captain Mike Henry and Captain Rick Brandelli in this excellent wounded warriors program designed to assist Firefighters and ALL the people who love and support and care about them and their important work. Your support of this intensive healing work is greatly appreciated, right now more than ever. THANK YOU FIREFIGHTERS. BILL ARENA is MCLA newsletter ✍ editor and Wisdom Council 🔥 agitator. Older PostGindling "Phoenix Rising From The Ashes"